So Sarahceratops and I have been busy working away on our cosplays for the conventions this year. We decided to go with the Princesses from Super Mario Brothers, with me being Peach and her being Daisy. We figured out most of our stuff over the summer, but it wasn't until winter break that we got down into business. As usual, I spent a lot of time trying to find the perfect wig online. We always resort to using e-bay because that is where we can find the widest array of colors, as well as good stores with affordable prices. I found a great seller [ http://myworld.ebay.com/cosplaydna] who carried heat resistant wigs. Yes, they do cost a bit more than other wigs, but I knew this would be perfect so I could curl and volumize for Peach. I haven't tested it out yet [but I'll edit this post again once I do, since I plan on experimenting tomorrow], but the color was finally one that matched [I had bought one back in September that I did not end up liking - it was too light and too curly]. I was also able to order a new wig for Roxas, but that's a different story. After the wig Sarahceratops and I went shopping for fabric which proved to be troublesome. Of course yellow and orange were hard to find for her, but we wanted a nice satin material that wasn't too shiny and sadly for me, all I could find was a type of bridal fabric that is pretty shiny. But I think once we're outside and walking around in the convention it won't be too bad. We also were lucky enough to find a pretty decent pattern. I was worried about sewing these because the dresses have such a dramatic shape, but we stumbled across some disney patterns. This one came with a pattern for Cinderella and Snow White, and we used the Cinderella pattern [here's the link to the pattern: http://www.simplicity.com/p-1736-costumes.aspx ]. It was very easy to follow, but of course, it took a lot of fabric so it was somewhat expensive. I highly recommend simplicity. Once we started sewing things got interesting. 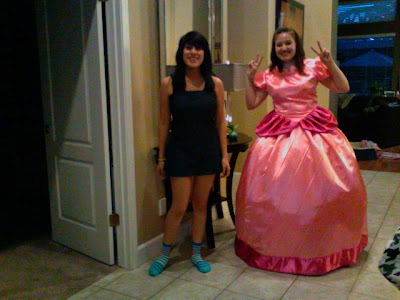 We worked on Sarahceratop's dress first since she had to return to school earlier than me which took about two days to finish from the beginning to end. We mostly altered the neckline so it was closer to the neck, and then we could add the lace. We made the dresses to our sizes, but for the sleeves, we used the largest size [14 on our patterns] for the sleeves so they were bunchy and exaggerated. For more details about the Daisy dress, check Sarahceratop's post. After doing the Daisy dress, I was well prepared to do Peach. If you are cosplaying the two together, I highly recommend using the same pattern and if possible, the same fabric. That way, you will match completely. For the dress I did not do much different for the sewing other than altering the sleeves and neckline. For Peach's neckline, she has a pink scalloped edge that I just whipped up a pattern for [use cardstock paper - drew it and then cut it out] and sewed it on. The neck is giving me problems but after ironing I think things will be okay. As for the bottom of the dresses, Daisy and Peach have a darker ring. Peach's was easy to do since it's just on the bottom, but Daisy's is harder because she has two, so make sure to check sarahceratop's post about that. The accessories have also been fun to find. I ordered long white opera-length satin gloves [you can find these on ebay with ease] that will not have to be altered. I also ordered a very large hoop skirt [on ebay as well, from any bridal store with high marks], and you'd be surprised how much this adds to the look. I'd say the hoop skirt is necessary to complete the look. The shoes I also ordered online just so that sarahceratops and I could get a similar look. This is a bit of a risk unless you are comfortable with your shoe size and ordering online. Mine could fit a bit better, but I will probably just add shoe comfort pads in to make it easier to walk around the con all day. As for her jewelry, sarahceratops and I got together one weekend up at my dorm to pump it all out. Look for an accessory tutorial to come soon. We also decided to make a couple of props. I ordered a very cute, light pink parasol [although peach has a yellow and blue one in her spin-off game, we wanted to match as much as possible so sarahceratops found a yellow one to match my pink]. I also will be making a super mario star bag so that I can carry around my con badge and stuff and it will be small and light, and easy to hide during photos. We may also in the near future make stuffed turnips or mushrooms to carry around as well. Here is a very low quality photo that my friend [cosplaying as female luigi with our group] and I took on my computer camera. There you can see the Peach dress just about finished [need to steam/iron out those weird lines that formed in the fabric from being rolled up at the store]. We look tired and silly after a long day of sewing but this will give you a good idea of how the process worked. Check for more updates from us soon about our Princess cosplays! i ordered long white opera- lenth satin gloves. Its good one.. I just noticed your blog and I hoped that you could give a novice cosplayer some pointers, specifically the sapphire jewel that is on Peach's dress. Hi there! What kind of pointers are you looking for?